Our sweet girl is one year old today!! Happy birthday, Ana Claire! Carter and I are still in shock that a whole year has gone by...but, boy, what a year it has been. We can't imagine life without this little one in it. She is our light and our joy and has made our family so much better. 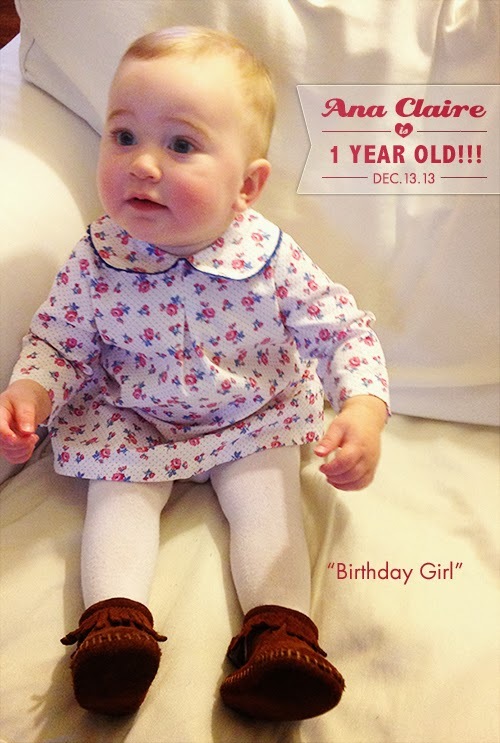 We feel so blessed that she joined us a year ago today. In true one-year-old fashion, she refused to keep her bow on for the picture...she's pretty feisty, this one. But she did let me put on her pretty dress that I have been saving for this occasion - it's by Kayce Hughes (hello adorable baby girl clothes) and absolutely darling. We are throwing a small birthday party for Ana Claire tomorrow with a Raggedy Ann theme and the dress is getting us in the party spirit. I'm hoping to take some good pictures I can share here with you...I always joke that Pinterest wasn't around when I got married and I feel cheated because of it, but I'm making up for lost time now that I'm planning events for Ana Claire. So, we'll be celebrating our birthday girl this weekend! I hope you have a great weekend and see you next week! All the best to Miss Ana Claire - she looks lovely in the dress! Thanks for sharing the website - I've been looking for a source of sweet baby girl dresses and this looks like the place. And the dresses are on sale!